Dog beds aren't just a comfortable place for your Fido to sleep at night. They actually serve many purposes. The best dog bed for small and large breeds will offers many physical and psychological benefits to a canine, but you need to pick the right one for your pooch. 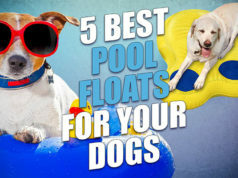 * Click on the best dog beds for more information, prices and details. Alternatively, scroll down below to read my reviews and watch video. First and foremost, a bed gives your dog a space that is all his. It's somewhere that he can retreat to when things overwhelm and stressed your pooch, and he wants a break from the chaos around him. Think of your dog's bed as his own little oasis within the walls of your home. Our dogs are social creatures by nature, but they do crave alone time once in a while. They may want some personal space while they're sleeping or chewing a bone. Sometimes our dogs are just having a bad day and want to lie quietly while they watch the business of you and your family members. Insulation – It's cooler in summer and warmer in winter. Security – Dogs love to have their own place and feel safe, secure. Cushioning – Dog beds provide support for your pet's joints and bones. Controlling hair – Having their own bed prevents hair and dander from ending up in yours. Preventing injuries – Dog beds ensure that your pooch won't be jumping everywhere and anywhere, potentially opening himself/herself up for different injuries. What type of pet bed would best suit your dog? What is your dog bed budget? What size bed will your pet need? No matter how well-reviewed a pet bed is, your pet's size and measurements of the bed are crucial. A dog bed that is too small will be more of a detriment to your pet's health, and a bed that's too large may not feel appealing to some canines. However, if your pooch is a puppy, you may want to choose a dog bed slightly too large that will be comfortable for him now and allow him the space to grow into as he ages. This will save you money in the future as you won't need to upgrade the pet bed every few months. In addition, you also need to think about your dog's sleeping style (how much your dog moves, what positions he sleeps in, etc. ), your dog's activity level, and of course your home decor. Most likely, you're not going to want a fancy looking bedazzled best dog bed in your rustically decorated living room. Sometimes, factors such as your dog's age, current health status, daytime behavior, and breed should also be considered. For example, if your dog suffers from severe arthritis, it will be extremely important to find a pet bed that provides the comfort and support that he'll need to sleep comfortably without joint pain. Which Dog Beds Are Likely to Fit Your Pet? As an owner of three dogs and editor here at Top Dog Tips, I've been buying and testing dog beds for a few years. For this year's best dog bed round-up, I've gone through all of my experience, I've tried a number of new pet beds and done hours of research to find ten of the best dog beds available. Below, I'll be sharing the pros and cons of each model in this article and what you must consider. I've found the best dog beds for small breeds, large breeds, multi-pet households and even the best option for families on a budget. My overall #1 top choice is the famous Big Barker Bed. While somewhat expensive, it's been the number one best-seller on Amazon for years now, and for a good reason. This dog bed is comfortable for any size dog (even if you have the largest dog breed), it's extremely sturdy and never goes flat (hence's company's 10-year warranty), it's easy to clean, and has a sleek design that will fit in well in any home. We will dig deeper and discuss all of these ten best dog beds, and I'll explain all about the different features of each, including my top Big Barker Dog Bed pick. Plus, I'll show you some other great alternatives that may be the right option for your pooch if my best dog bed pick isn't a good choice in your situation. After weeks of research, sorting through hundreds of product reviews and then testing pet beds with my own dogs, I've chosen my picks for the 10 best dog bed options available on the market today. There are a few features that you need to be focused on when shopping for the best dog bed. Some owners think that a soft, comfortable pet bed will be just fine for their pup. Others assume that a soft blanket on the floor is a suitable place for their pooch to sleep. With all of the reasons that we discussed above, you now understand why your dog needs a bed, but what features should the bed have? I've evaluated every best dog bed option on this list for these four key features and a few additional ones. I learned a lot about the quality of the materials used to make dog beds while researching for this article. For example, while many dog beds are made with foam, there are different types of foam that's used and the quality of these foam materials can be very different, and have a significant impact on bed's quality. My dogs testing Big Barker bed. We already discussed why dogs need support while they sleep, but it's up to you to choose a pet bed that can provide enough support for your Fido. This might be a little bit simpler for dogs owners with small pups; however, it can be quite difficult if you have a large, heavy dog. Of course, your dog's comfort is also a big factor. Likewise, finding the best dog bed that fits into your budget and accompanies your home decor is also something to consider. We'd all love to give our dog a luxurious pet bed that provides maximum support and comfort. Unfortunately, the best quality beds can also cost hundreds of dollars! I'm certainly no expert on dog beds, and I'm not associated with any companies that manufacture or sell pet beds. However, I have been using different dog products for decades and have been reviewing pet products for more than 5 years. 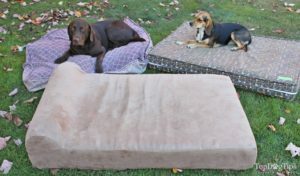 I have tested thousands of dog supplies over that time, including many dog beds (you can see my reviews here). I've been interviewing veterinarians, manufacturers, company owners and other canine experts to learn more intricate details and get insider information. I've been a dog owner since I was born and a writer on all things dog for nearly a decade. This experience has allowed me to polish my researching skills and develop an eye for what to look for in pet products, how to rate and rank them in terms of price-to-value ratio, and other important factors that are specific to the type of dog supplies that I'm writing about. As we all know, purchasing pet products for our own dogs can be a chore. Over the years, I have become an expert at making smart purchases for my dogs. Quality is always my top concern, and I compare the price to the value of the product to make sure that my money is well spent. That's what I bring into these dog supplies reviews – ensuring that anyone looking for a good dog product doesn't waste their hard-earned money. When I do these reviews, I research the products like I would if I were buying them for my own dogs. I consider the tips and advice I get from experts I've had a chance to talk to about pet supplies. 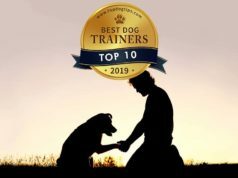 I want to make sure that the dog supplies that I review and then recommend here on Top Dog Tips are top quality and will last throughout your pet's lifetime. I take this responsibility very seriously. Finally, unlike some other writers, I do not get paid by ANY dog product companies to write these best dog supplies reviews and round-ups. Everything that you read in this comparison article is my opinion based on the products that I've tested and my experience with pet products in the past. Now that we've gotten that disclaimer out of the way, here are my top 10 picks for the best dog bed. I've broken the list down into the best options for large breeds, small breeds, pets with separation anxiety, and even dogs that like to nest. The #1 best dog bed. The price might scare you a little bit, but be sure to read the details about this bed before you let that deter you. The first thing you need to know is that this bed is guaranteed for 10 years. So, let's say you need the Giant size that costs about $400. If you do the math, that's only about $40 per year to provide your pet with this high-quality bed. These beds are specifically made for large breed dogs that weigh at least 80 pounds. They are made with 7″ of American-made orthopedic foam. The top 2″ is comfort foam, the middle layer is 3″ of support foam, and the bottom 2″ is another layer of comfort foam. The bed that I tested with my dogs also has a headrest that is made of 4″ of contoured comfort foam. Big Barker guarantees that the beds will retain 90% of their original shape and loft for ten years or they will give you a full refund. The 100% microfiber covers are machine washable and available in 4 colors. You can choose from Burgundy, Charcoal Gray, Chocolate and Khaki. I really like the look of the Big Barker Pillow Top Orthopedic Dog Bed. They're sleek and elegant, and the colors will match any home décor. I've washed the cover of our Big Barker bed more than a dozen times, and it's held up very well. Being easy to clean is a MUST for any dog bed in our home, and I'm sure it's important to most pet owners. Our dogs chew bones and chews on their bed, so between the slobber and residue from the treats their beds get pretty gross after a couple of weeks. Big Barker dog beds help to reduce the stress and pressure on the dog’s joints. The unique 3-tier foam engineering process keeps your pooch up off the floor so he’s not putting all his wight on vulnerable pressure points. This saves him a lot of pain, especially if he’s already suffering with hip or joint issues. have arthritis or hip dysplasia. The Big Barker Pillow Top Orthopedic Dog Bed has a thickness (7-inches) that makes it easier for large dogs to stand up, as they won’t have to raise themselves from the floor. All the beds are manufactured in the USA, and no China-made materials are used (unlike with many other dog beds currently available on the market). The obvious drawback to these beds is the enormous expense. Many pet owners can't afford to spend $300-$400 on veterinary expenses, let alone spending it on a dog bed. Just remember that most dog beds do not last for more than 6-12 months. With a 10 year guarantee, you're sure to your get your money's worth out of a Big Barker bed. For a closer look at this best dog bed, check out my extensive Big Barker review here. If you're not a huge fan of the pattern that I have, don't worry. This best dog bed has a removable cover that is available in dozens of patterns. You could even purchase multiple covers to change with the seasons or whenever you feel like sprucing things up. There are bold, bright patterns and simple, neutral designs. I like all of the options, because pet owners can find a cover that matches their home's décor. In case you are wondering, the pattern that I've chosen is called Charcoal Arrows. The inside of the bed is a 5″ piece of gel-infused memory foam. The foam is CertiPUR Certified, which simply means that the foam is safe and made without many common chemicals found in other memory foam materials. The top layer is 2″ of orthopedic gel memory foam swirl foam, and the bottom 3″ is high density support foam. eLuxury Supply is a veteran-owned business, and they take pride in the fact that their dog beds are made in the USA. The #2 best dog bed. The bed covers are made of 100% cotton. There is also a waterproof interior cover, which is my favorite feature of this bed. If your dog has incontinence issues or you have a puppy that may still have accidents, you're going to want to be sure to buy the best dog bed that has a waterproof cover. Like the Big Barker bed, the cover of this best dog zips off easily and is machine washable. The company does offer a 90 night risk-free money back guarantee, but unlike Big Barker they don't tell you how long the memory foam will hold it's shape. Most high-quality dog beds made with similar materials are guaranteed for 6-10 years. Many pet owners have had this bed for more than three years, and they still say it is holding its shape well. The price depends on the size of the bed, and they range from $75.99-$140.99. They're still quite expensive, but not as expensive as the Big Barker beds. eLuxury also offers the option for a payment plan if you order through their website, which is a nice choice for dog owners on a tight budget that still want to provide the best dog bed for their pet. For a closer look at this best, check out my eLuxury Dog bed review here. This bed is unique twist on a traditional dog bed. The cover is made from 100% cotton canvas. It is very durable, machine washable and pre-shrunk. Like the eLuxury bed above, Molly Mutt Dog Duvets are available in many patterns – 22 different patterns to be exact! When I say durable, I mean durable. I had my doubts when I first received this dog bed. Our dogs are nesters, especially our little Beagle. She'll scratch and scratch in one spot for about 2 minutes before she finally settles down to sleep. Months later, our Molly Mutt bed still looks like new! So, what's inside these beds…well, nothing. Yes, when you receive Molly Mutt Duvets there is nothing inside them. That's because you get to fill it with any material of your choosing. You can fill these duvets with old clothing, blankets, towels or any other material that will provide a soft, comfortable bed for your pet. This is the best dog bed for pets suffering from anxiety issues. Research has proven that it's comforting for your dog to have a bed that smells like you. You are comforting to your pet, and when you're not around your smell can be the next best thing. The #3 best dog bed. The Stuff Sack that I show in my video review is very helpful, but it isn't included with the Molly Mutt Duvets. You can buy one separately for $12.50. These bags are made of 100% nylon. While it's a small added expense, I highly recommend getting the Stuff Sack as well. It offers an easy way to keep all of the materials you use as stuffing together. And, the best part is that the Stuff Sack is machine washable, you can just pull it out with all of the stuffing material, throw it in the washer and dryer, and there the stuffing will be clean and odor-free. The drawback to this bed is that using materials like blankets and old clothing as bedding won't be nearly as supportive as the orthopedic foam used in the Big Barker and eLuxury Supply beds above. It's a better option for dogs with anxiety problems (especially separation anxiety), but it's not going to be the best dog bed for pet's with arthritis or other hip and joint problems. Molly Mutt Dog Duvets sell for $25-$50, depending on the size that you need. If you add the expense of a Stuff Sack, that takes the price to $27.50-$62.50. For a high-quality, durable bed, that's a pretty average price. Just keep in mind that you will have to provide your own stuffing. For a closer look at this best, check out my extensive Molly Mutt dog bed review here. Did you know that most dogs prefer elevated beds. These beds are strong enough to hold your pet, as long as you follow the manufacturer's instructions on the proper size. They are usually up about 2″-6″ off the floor. Elevated beds allow air to flow under the bed, which can help keep Fido cool while he sleeps. Also, because the bed isn't sitting on the hard floor it reduces the pressure put on your dog's bones and joints. After all of my research and product testing, I've chosen the Coolaroo Elevated Pet Bed as the best elevated dog bed. This bed is made with a powder-coated steel frame and breathable fabric that is UV-treated to resist fading. The Coolaroo Elevated Pet Bed can be used indoors or outside. The first three beds on my list are only made for indoor use. You can bring them outside when the weather is nice, but if you leave them out they will get damp and begin to mold. This bed, on the other hand, resists mold and mildew. It's also flea and mite resistant. Again, the first three beds are on my list will actually be a great place for fleas and mites to live, so if you're concerned about parasites, the Coolaroo bed is a great choice. If your dog loves to nest, providing him with the best dog bed with bolsters, sides or a pillowy style is a great way to keep him happy and comfortable. This bed has high walls that surround your dog and make him feel like he's a den. Beds like this one will often make dogs feel safer and more secure while they're resting. Unfortunately, these style beds are usually made for small dogs. This is the case with the Best Friends by Sheri OrthoComfort Deep Dish Cuddler. It's made for dogs that weigh less than 25 pounds. The rear bolster is 12″ high, which provides a wall that your dog can lie against. The front bolster is only 9″ high, and acts as head support for dogs that want it. The soft, fleecy material on the outside keeps your pup comfortable, and the inside is stuffed with virgin AirLOFT fibers. Best Friends by Sheri says that these fibers keep their shape longer than the traditional poly-fill used in most dog bed products. The best dog bed must be easy to clean, and this one definitely is. It's machine-washable and dryer-safe. It also features a waterproof bottom, which keeps any liquids (like urine) in the bed and off your floor. If your dog has an accident in the bed, just throw it in the wash and you won't have to worry about it staining your carpet or leaking onto the floor. The Best Friends by Sheri OrthoComfort Deep Dish Cuddler is available in 10 different colors. The price varies depending on the color that you choose. Depending on your selection, this best dog bed will cost between $28 and $37.43. Even for a bed that is only made for small breeds, this is a very reasonable price. This is another orthopedic dog bed that provides excellent support for your dog's bones and joints. You'll also notice that this bed has a bolster all the way around it. Most dogs love this style bed, because the bolster provides extra support and makes them feel more secure. Sadly, this best dog bed only comes in one size. It's made for medium and large breeds and measures 40″ X 30″ X 10″. Keep in mind that the inner dimensions are only 36″ X 24″. The BarksBar Orthopedic Dog Bed would also be a good choice for a multi-pet household with dogs that enjoy sleeping together in the same bed. The company says that this bed can easily hold up to 100 pounds. This best dog bed features an ultra-soft polyester cover with quilted design for added comfort. The inside is made of 4″ of solid, grooved orthopedic foam. The bolster is stuffed with cotton, so it may not hold its shape as well as the orthopedic foam. I love that the bottom is equipped with a rubber non-slip backing. If you have wooden, tile or laminate flooring, this is an important feature to look for. It's difficult for old dogs to get up off of a bed that slides on the floor when they try to step out of it. Likewise, rambunctious younger dogs may get hurt if they try to jump into a bed that's going to slide out from under them. As with the other beds on this list, the BarksBar Orthopedic Dog Bed is easy to clean. The cover is easily removable and machine washable. It does need to be washed on the delicate cycle though, so keep that in mind. Pet owners that recommend this bed also say that it is very easy to spot clean, and it's easy to get shed dog hair off of this bed. This is the second elevated bet bed that has made my list. As I said, elevated beds will get your dog up off the floor. This will make Fido more comfortable and keep him cool while he sleeps. As you can see, this elevated bed also has a bolster, which adds comfort and prevents your pooch from falling off the bed. This doggy cot is made with a sturdy frame construction that can hold more than 150 pounds! This is the best elevated dog bed for extra-large breeds. The breathable mesh center is made of waterproof, 600 Denier fabric. This fabric repels moisture, mildew, mold, odors and bacteria. You can easily clean this best dog bed by wiping it down with a damp cloth or spraying it down with the hose if you're outside. The removable bolster is machine washable. Like the BarksBar bed above, this one has non-skid rubber on the bottom of the feet. You'll be glad to have these, because it will greatly reduce the risk of injury. This elevated dog bed from K&H Pet Products doesn't come assembled, but putting it together requires no tools. The price depends on the size you'll need, and this bed will cost between $43.03 and $61.14. For a durable, elevated pet bed that can be used both indoors and outside, this is a very affordable option. Look how comfortable this bed looks! It cradles your dog for comfort and support while he sleeps. This design is ideal for dogs that like to nest and pets that enjoy resting their head on a bolster while they sleep. It's stuffed with a premium high loft polyester fill, which may not hold up as well as thick, dense foam. 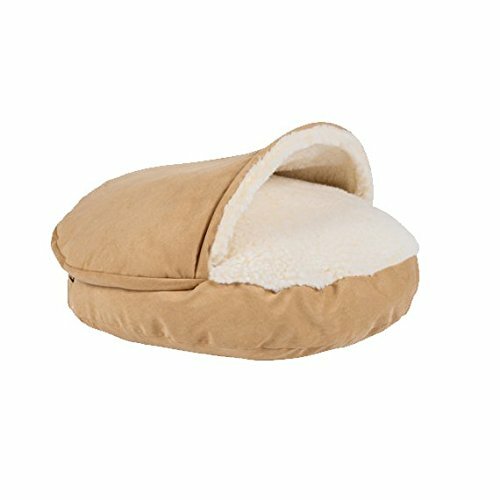 Best Friends by Sheri bed in my number 5 spot, the bottom of the Majestic Pet Bagel Bed is made of waterproof 300/600 Denier fabric, which is 100% waterproof. If your pet has accidents, this is a feature that you should be looking for. It will keep the urine from leaking through the bed and onto your flooring. As you know, being easy to clean is a must when it comes to the best dog bed. The Majestic Pet Bagel Bed is machine-washable and dryer-safe. It is made in the USA, but the materials are imported. The price varies depending on the size and color that you choose. These beds cost between $21.99 and $76. I'm really impressed with the pricing, but some reviewers did say the beds didn't last as long as they had hoped. This seemed to be a more common complaint among pet owners with large dogs. Another unique design, these beds are perfect for pups that like to be under the covers while they're snoozing. 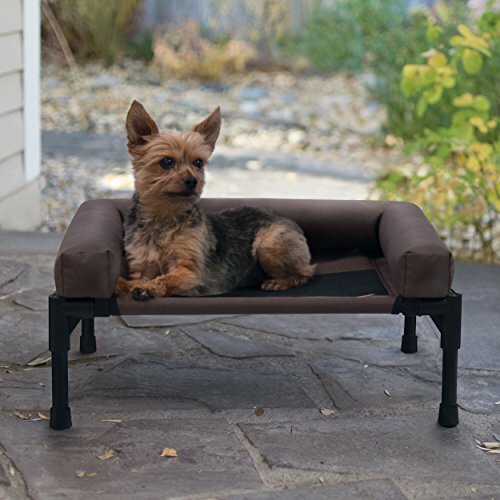 The design offers a plush bed for Fido to sleep on and soft covering for him to snuggle under. The “cave” design of this bed is great for dogs who need a little help to feel safe and secure. Dogs are natural denning animals, and this bed offers the feel of a den in the safety of your home. The poly cotton exterior comes in more than 25 colors, and the inside of the Snoozer Luxury Cozy Cave Pet Bed is lined with soft Sherpa for extra comfort. It's also available with a microsuede exterior. The cover is machine washable for easy cleaning. This bed is stuffed with cedar/poly filling, which helps to reduce odors. Unfortunately, this type of filling doesn't keep its shape as long as dense, orthopedic foam. The price varies depending on the color and size. 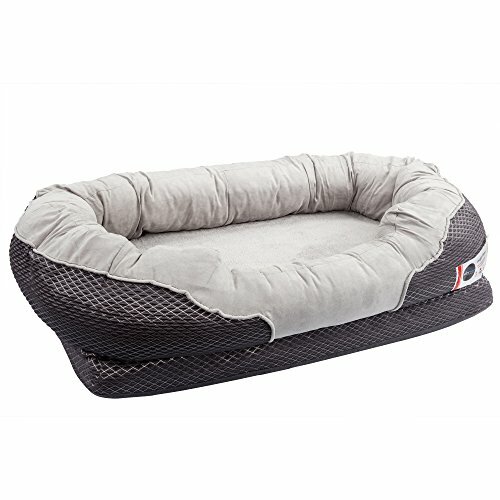 If you think that this unique dog bed is right for your pet, it'll cost you $79.95-$152.89. It's slightly more expensive than other beds of its size, but the original design warrants the increase. You know Simmons Beautyrest as a big name in the human mattress market, and now you can give your dog the same trusted comfort. They use a dual blend of orthopedic materials in the making of this best dog bed. It consists of a memory foam mattress topper with a convoluted foam pad underneath. Not only does the Simmons Beautyrest Thera Bed Orthopedic Memory Foam Dog Bed make a great bed to keep in your home, it's also thin enough to be placed in a crate or taken along while traveling. The orthopedic foam contours to your dog's body. Like the other orthopedic options on this list, this best dog bed is ideal for dogs with arthritis, joint issues and painful diseases like hip dysplasia. The removable cover is machine washable, but you'll have to spot clean the internal foam. If your pup has incontinence issues or still has accidents once in a while, it would be better to invest in one of the best dog beds that has a waterproof cover. If your dog pees on this bed, it will leak right through into the foam. The price varies depending on the size you'll need, but you can expect to pay between $33.99 and $72.53 on one of these dog beds. As far as orthopedic dog beds go, that's pretty cheap. But, this bed also isn't as thick as most other beds made with similar materials. For example, the Big Barker bed in the number one spot on my list is 7″ thick. That's more than 3X thicker than this one. Disclosure: We may earn affiliate commissions at no cost to you from the links on this page. This did not affect our assessment of products.Read more hereand findfull disclosure here.